BACKGROUND AND PURPOSE: The purpose of this study was to analyze the immediate and long-term angiographic and clinical results of endovascular treatment of posterior circulation aneurysms with special regard to technical development. MATERIALS: Between 1993 and 2003, 46 patients with 47 aneurysms of the posterior circulation were referred to our institution for endovascular treatment. Mean angiographic follow-up was 1.7 years. Clinical follow-up was determined at hospital discharge and by using a questionnaire for long-term follow-up (mean, 3.3 years). To analyze technical development, patients treated before (group 1) and after (group 2) implementation of 3D Guglielmi detachable coils (3D GDCs) in 1999 were compared. Multivariate analysis was performed to determine factors predictive of clinical and technical outcome. RESULTS: Overall, at initial treatment complete occlusion was achieved in 27 (57.4%) aneurysms, a neck remnant was present in 16 (34.0%) aneurysms, incomplete occlusion was achieved in 3 (6.4%) aneurysms, and in 1 (2.1%) case occlusion was not attempted. Procedure-related permanent morbidity was 4.3%, and the mortality rate was 0%. There was no rebleeding of treated aneurysms. Complete occlusion at initial treatment (P = .003) and recanalization rate (P = .008) correlated with aneurysm sac size. A statistically significant relationship between Hunt and Hess/World Federation of Neurologic Surgeons clinical grading scale score and clinical outcome (Glasgow Outcome Score) was found (P < .05). Subgroup analysis revealed that a higher initial obliteration rate of larger aneurysms was achieved in group 2 (3D GDC, 22 patients, 22 aneurysms) than in group 1 (23 patients, 24 aneurysms; P = .03). At angiographic follow-up, overall recanalization was 47.1% in group 2 and 47.6% in group 1. Aneurysm neck size was not found to be correlated with occlusion and recanalization rate. CONCLUSION: In our series, GDC technology was an effective and safe technique for the treatment of posterior circulation aneurysms. Aneurysm sac size was predictive for occlusion rate and the Hunt and Hess/World Federation of Neurologic Surgeons grade for clinical outcome. The introduction of 3D GDCs into our practice significantly improved the initial occlusion rate but did not affect the incidence of recanalization. Several recent developments of the endovascular treatment by using Guglielmi detachable coils (GDCs) in terms of microcatheter improvements, evolving coil technology, and introduction of adjuvant devices such as intracranial stents and the TriSpan neck-bridge device have led to improved anatomic and clinical outcomes. The use of 3D GDCs enabled the treatment of intracranial aneurysms with an unfavorable geometry with or without the need for adjunctive techniques as compared with conventional GDCs (1, 2). Angiographic and/or other imaging techniques such as MR angiography (3) and clinical follow-up studies are essential to ascertain the efficacy and long-term effect of endovascular aneurysm treatment a decade after its introduction in the clinical setting (4, 5). There are, however, still few series analyzing the long-term efficacy of endovascular coiling with respect to permanent occlusion and prevention of rebleeding (6–9). The purpose of this study was first to evaluate our 10-year experience regarding the immediate and long-term efficacy, as well as the factors predictive of anatomic and clinical outcome, in the endovascular treatment of posterior circulation aneurysms. Second, we aimed to compare the treatment efficacy before and after the introduction of 3D GDCs at our institution in 1999. We conducted a retrospective review of medical records and angiographies of patients who underwent endovascular treatment for posterior circulation aneurysms between March 1993 and June 2003. Anatomic and clinical analysis was conducted for 46 consecutive patients harboring 47 aneurysms of the posterior circulation. The patients were selected for endovascular treatment after assessment by the referring neurosurgeon and the interventional neuroradiologist. There were 27 (58.7%) women and 19 (41.3%) men, with a mean age of 54 years (range, 15–78 years). Thirty-six (78.3%) patients had ruptured and 10 (21.7%) had unruptured aneurysms. Of the 10 patients who had unruptured aneurysms, 6 were asymptomatic and 4 symptomatic because of a mass effect. Initial clinical grading was performed according to the Hunt and Hess grading scale (10). Bleeding on the CT scan was quantified by using the Fisher scale (11). Patient data and characteristics at admission are shown in Table 1. Diagnostic conventional selective cerebral angiography was performed by using biplanar digital subtraction angiography (DSA; Angio G-ring CAS 500, Toshiba, Tokyo, Japan). The system software allowed real measurement of the diameters of the aneurysm in the center of the image (12). The locations of the 47 aneurysms are summarized in Table 2. On the basis of angiographic data obtained at the time of embolization, the aneurysms were classified by size and neck width. Aneurysms were measured according to their longest axes on selective angiograms. Eighteen (38.3%) of the aneurysms were small (<7 mm), 19 (40.4%) were intermediate (7–12 mm), and 10 (21.3%) were large (>12 mm), with a range of 3–20 mm. Neck size was estimated according to the projection showing the widest neck and was classified as ≤4 mm or >4 mm. These measurements have been critical to the results of treatment with GDCs (13). Twenty-nine (61.7%) aneurysms had small necks (≤4 mm), whereas 18 (38.3%) had large necks (>4 mm). All endovascular treatments were performed in the neuroangiography suite, and the patients received general anesthesia because it provided for better control of the cardiorespiratory condition and allowed a controlled response to technical and clinical complications. Our policy is not to use systemic anticoagulation therapy during the treatment procedure to achieve optimal clot formation and attenuated packing in the aneurysm. The presence of thromboembolic events with systemic anticoagulation therapy compares with our incidence rates without systemic anticoagulation therapy. The transfemoral approach was used and vertebral artery angiography was performed with nonionic contrast medium (Iopamiro 300, Bracco, Milan, Italy) to define the optimal projection for the best definition of the aneurysmal neck and its relationship to the parent vessel and adjacent arterial branches. Depending on the size of the aneurysm to be treated a Fast-Traker-18 or -10, more recently an Exel-14-microcatheter (Boston Scientific/Target, Natick, MA), ordinarily was used. The microcatheter was placed coaxially through a 6F guiding catheter (Envoy, Cordis Neurovascular, Miami, FL; or Guider, Boston Scientific/Target). By using magnified fluoroscopy and digital biplane road-mapping, the microcatheter was navigated into the aneurysm with the aid of a 0.010- or 0.014-inch guidewire (Fas-Dasher; Boston Scientific/Target, or Silver Speed, Medtronic MIS, Sunnyvale, CA). Throughout the 10 years they have been in use, the technology of GDCs has changed, and most of the currently available GDCs (Standart/Soft/SR/Ultrasoft) have been used at various times over this time period. Large and accidental aneurysms were normally treated by using coils with diameter of 0.0018 inch (GDC-18), whereas GDC-10s were normally used in acute and small aneurysms. TriSpan and 3D GDCs were introduced in 1999 for wide-necked aneurysms or aneurysms with an unfavorable geometry. In large or wide-necked aneurysms, 3D GDC-18s were used, which was the case in 10 aneurysms in the present study. In smaller and narrow-necked aneurysms, 3D GDC-10s were applied to 12 aneurysms. It was our practice to introduce only one 3D GDC in each of the treated aneurysms. The GDCs were delivered by using biplane road-mapping, and the procedure was considered terminated if a solid cast of the aneurysm was achieved, control angiography confirmed devascularization of the lumen of the aneurysm, or herniation of the last GDC into the parent artery was observed. In older patients harboring aneurysms with an unfavorable anatomy or in patients in poor neurologic condition, the procedure was sometimes discontinued when the dome and its identified ruptured site were occluded despite leaving a visible neck remnant. A Neuroform stent (Boston Scientific/Target) was used in three cases with wide-necked aneurysms to prevent the coils from bulging in to the parent vessel. After embolization, the patients were transferred to the neurosurgical intensive care unit. All aneurysms were evaluated angiographically immediately after treatment. The aneurysmal occlusion rate was estimated from the ratio of the occluded aneurysmal area to the initial aneurysmal area. The anatomic results were classified as follows: complete occlusion, neck remnant, or incomplete occlusion. According to an occlusion rate >95%, occlusion rate was complete when the sac and neck of the aneurysm were densely packed and when the control angiography visualized no contrast penetration between the mesh of the coils. Neck remnant referred to lesions with residual filling of a part of the aneurysm neck and incomplete occlusion when the sac and a neck remnant was opacified. First angiographic follow-up was routinely obtained 6 months after embolization by using DSA and in the course of time ranging up to 10.2 years by using MR angiography with ultrashort echo times (3), with a mean angiographic follow-up of 19 months. The changes observed on follow-up angiograms were classified as unchanged, which is defined as a similar degree of aneurysm occlusion rate, and recanalization, which is defined as an increase in the amount of contrast material filling the aneurysm, compared with the immediate posttreatment angiographic results or the latest follow-up angiogram. Clinical condition at the time of treatment was determined with the Hunt and Hess grading (10) and the World Federation of Neurologic Surgeons (WFNS) clinical grading scales (14). Clinical outcome was assessed at hospital discharge by using the Glasgow outcome scale (GOS) (15). To determine the long-term clinical outcome a questionnaire was used, which allowed calculation of the GOS based on the given answers. In cases where no response could be obtained, the latest report on the patient’s clinical presentation was used. Hunt and Hess grade, WFNS, Glasgow coma scale, Fisher score, aneurysm sac size, and aneurysm neck size were analyzed for correlation with outcome end points by using the Kruskal-Wallis test and Mann-Whitney test. Pearson correlations were used to detect correlation among all normally distributed variables, and Spearman ρ was used for ordinal-scaled or not normally distributed variables. The level of significance was considered at P = .05 for a two-tailed hypothesis, if not otherwise specified. Statistical tests were used with an explorative intention and no alpha-correction was performed. Coil deployment could be performed successfully in 45 patients (97.8%) harboring 46 aneurysms. Coil deployment could not be attempted in one patient (2.2%). In one patient coil deployment was not possible because of massive ectasia and vasospasms of the vertebral artery; this patient was treated by microsurgical clip application. 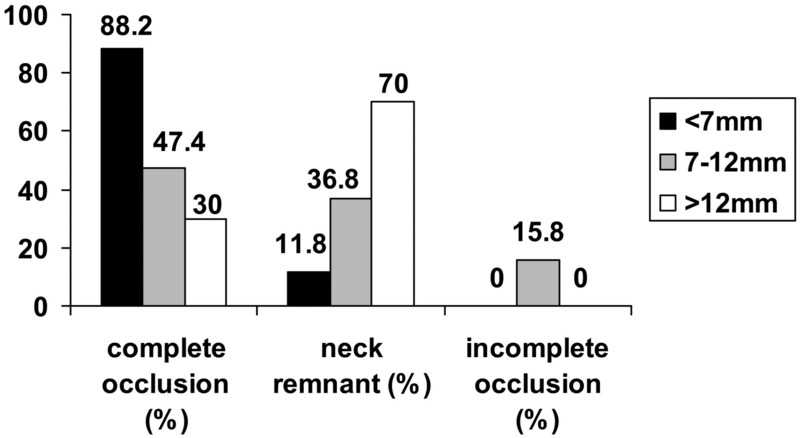 In 27 (57.4%) aneurysms complete occlusion could be achieved, a neck remnant was found in 16 (34.0%) aneurysms, and incomplete occlusion remained in 3 (6.4%) aneurysms. Fifteen (88.2%) of the small aneurysms (<7 mm) were completely obliterated, and in two aneurysms (11.8%) a neck remnant was observed. Nine (47.4%) of the intermediate aneurysms (7–12 mm) were completely occluded, seven (36.8%) remained with neck remnants, and three (15.8%) were incompletely obliterated. 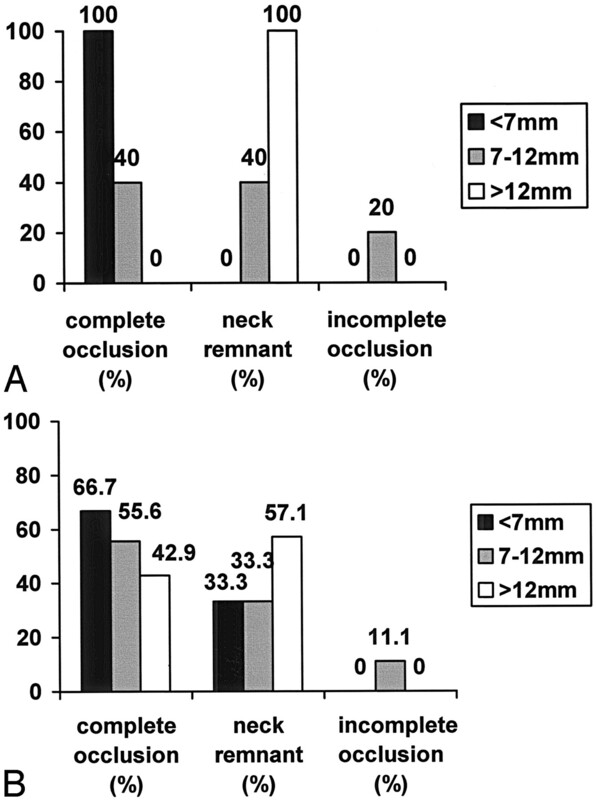 Three (30.0%) of the large aneurysms (>12 mm) showed complete occlusion, and seven (70.0%) had a neck remnant. The immediate angiographic outcome is summarized in Fig 1. Percentage of aneurysms occlusion rate according to sac size at completion of the initial embolization. Bars represent sac size: black < 7 mm; gray = 7–12 mm; white > 12 mm. We combined the use of intracranial microstents and the GDC system in three (6.7%) cases. The TriSpan device, in addition to the GDC system, was used in two (4.4%) cases. Univariate statistical analysis showed that complete occlusion at initial treatment correlated with aneurysm size (P = .003). The subset of aneurysms >12 mm showed significantly lower occlusion rate compared with those 7–12 mm and those <7 mm. Eighteen (62.1%) of the treated small-necked (≤4 mm) aneurysms were completely occluded, 10 (34.5%) had a neck remnant, and 1 (3.3%) had an incomplete occlusion. 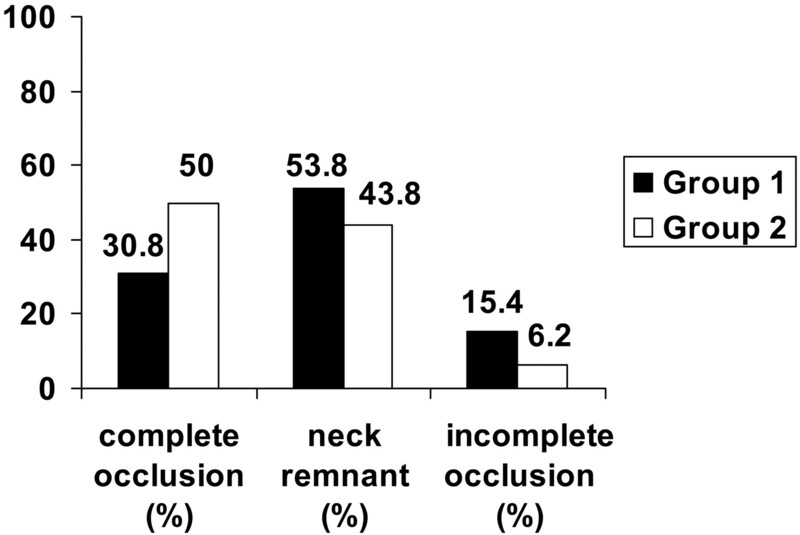 Nine (52.9%) of the wide-necked (>4 mm) aneurysms showed complete occlusion, six (35.3%) had a neck remnant, and two (11.8%) had incomplete occlusion. The neck size did not significantly correlate with the occlusion rate. Follow-up angiograms were obtained in 37 of the treated patients (82.2%), with a total of 38 aneurysms. The mean angiographic follow-up period was 19 months (range, 3–122 months). Long-term angiograms could not be collected in eight patients: six patients had died during the initial hospitalization because of the subarachnoid hemorrhage (SAH) and its sequelae or because of other extracranial diseases, and in two patients the angiographic follow-up has not yet been performed but is scheduled. Overall recanalization was observed in 18 (47.4%) aneurysms, whereas 20 (52.6%) aneurysms remained unchanged. Recanalization was detected in 25.0% (4/16) of the small aneurysms (<7 mm), 53.8% (7/13) of the intermediate aneurysms (7–12 mm), and 77.8% (7/9) of the large aneurysms (>12 mm). Follow-up angiographic outcome is shown in Fig 2. Percentage of aneurysms occlusion rate according to sac size at final angiographic follow-up. Bars represent sac size: black < 7 mm; gray = 7–12 mm; white > 12 mm. There was a significant correlation between aneurysm size and recanalization at latest follow-up (P = .008). Recanalization was found in 47.8% (11/23) of the small-necked (≤4 mm) aneurysms and 46.7% (7/15) of the wide-necked (>4 mm) aneurysms. Aneurysm neck size was not found to be statistically correlated with recanalization. Following Murayama et al (9), we divided the treated patients for comparative purpose into two groups: group 1 included the initial 5 years of experience with 23 patients harboring 24 aneurysms treated only with standard GDCs, and group 2 included the latter 5 years of experience after the introduction of 3D GDCs in 1999 with 22 patients harboring 22 aneurysms. To analyze the effect of 3D GDCs on anatomic outcome, we compared the aneurysm occlusion rate by using only standard GDCs (group 1) with the achieved occlusion rates after the introduction of 3D GDCs (group 2) in 1999. In group 1, there were 24 (52.2%) aneurysms. All 11 (100.0%) small aneurysms showed complete occlusion at initial treatment. Four (40.0%) of the intermediate aneurysms were completely occluded, four (40.0%) showed neck remnants, and two (20.0%) were incompletely obliterated. All three (100.0%) large aneurysms had a neck remnant. In group 2, there were 22 (47.8%) aneurysms. Four (66.7%) of the small aneurysms were completely obliterated, and two (33.3%) had neck remnants. Five (55.6%) of the intermediate aneurysms were completely occluded, three (33.3%) had neck remnants, and one (11.1%) was incompletely obliterated. Three (42.9%) of the large aneurysms showed complete occlusion, and four (57.1%) showed neck remnants. The data are illustrated in Fig 3. There was a significant correlation between complete obliteration and larger aneurysm size in the group in which 3D GDCs were used compared with the group in which standard GDCs were used (P = .03) only, as shown in Fig 4. A, Percentage of aneurysm occlusion rate according to sac size at completion of the initial embolization in the early group before the introduction of 3D GDCs. B, Percentage of aneurysm occlusion rate according to sac size at completion of the initial embolization in the early group after the introduction of 3D GDCs. Percentage of aneurysm occlusion rate for aneurysms >7 mm at completion of the initial embolization in the early group before the introduction of 3D GDC (group 1) and in the group after the introduction of 3D GDC (group 2). At angiographic follow-up, overall recanalization in group 1 was 47.6% (10/21); 27.3% (3/11) of the small aneurysms showed recanalization, corresponding to 57.1% of the intermediate aneurysms and 100.0% of the large aneurysms. In group 2, overall recanalization was 47.1% (8/17); 20.0% of the small aneurysms, 50.0% of the intermediate aneurysms, and 66.7% of the large aneurysms were recanalized. Of the 45 patients treated with the GDC system, 29 (64.4%) showed good recovery (GOS V), 6 (13.3%) had moderate disability (GOS IV), 4 (8.9%) were severely disabled (GOS III), none (0%) were in a vegetative state, and 6 (13.3%) died (GOS I). Overall, 35 (77.7%) patients had excellent or good recovery (GOS V and IV) on hospital discharge. The Hunt and Hess grades and GOS scores on hospital discharge are summarized in Table 3. Of the 10 patients presenting with unruptured aneurysm (Hunt and Hess grade 0), 7 (70.0%) showed a score of GOS V and 2 (20.0%) a score of GOS IV. One (10.0%) patient harboring an unruptured basilar tip aneurysm died 1 month later, during the hospitalization, because of a metastasizing carcinoma of the mamma. Overall, of the patients presenting in Hunt and Hess grades 0–3, 84.2% (32/38) achieved a GOS V or IV outcome score. A significant relationship between Hunt and Hess grade at presentation and clinical outcome at hospital discharge was demonstrated (P = .01). Other variables at presentation were analyzed for their potential contribution to patient outcomes. Specifically, a low WFNS score (P < .05), the presence of hydrocephalus (P < .05), and advanced age (P < .05) were found to be correlated with worse outcome measured by GOS score. By contrast, Fisher scale was not significantly correlated with clinical outcome. Of the initial 39 surviving patients, 34 questionnaires were sent. Three patients were currently hospitalized for an angiographic control, so clinical follow-up could be performed directly. Long-term clinical follow-up could not be performed in the seven patients who had died during the initial hospitalization and in two patients from whom no clinical control data and actual address information were available in the records. Twenty-seven patients (73%) returned the questionnaire; seven patients did not. For these seven patients, the latest clinical control at our institution was used. The mean duration of clinical follow-up was 3.3 years (range, 3–122 months). Among our patients, 94.6% (35/37) achieved a GOS score of V or IV, and 5.4% (2/37) showed a GOS score of III or II at the latest clinical follow-up. There was no case of procedure-related mortality in the series (mortality rate, 0%). Overall, there were two complications leading to permanent morbidity, for a rate of 4.3%. These included one case of aneurysm perforation and one case of thromboembolic event. Two thromboembolic procedure–related complications and one 3rd cranial nerve palsy were encountered that lead to transient neurologic deficit, for a rate of 6.5% (3/46 cases). There was no rebleeding of a treated aneurysm during the follow-up period (mean, 3.3 years; range, 3–122 months). A retreatment of a coiled aneurysm due to compaction of the coils, recanalization, or incomplete treatment was performed in seven (15.6%) patients. Four (8.9%) patients underwent recoiling. In three patients, recoiling was needed to remedy coil compaction in intended neck remnants because of possible parent artery occlusion. In one patient, aneurysm perforation occurred during the first coiling session, resulting in insufficient occlusion of the aneurysm dome, which needed a second endovascular treatment. Three (6.7%) treated patients underwent microsurgical clipping of the aneurysm. In one patient with an extremely wide-necked aneurysm, significant recanalization occurred after only 6 months, so clipping was performed. In one patient with a polylobulated vertebrobasilar junction aneurysm with complex morphology, incomplete coiling was used to prevent early rebleeding. The aneurysm was then clipped 12 days later. In one patient with two posterior inferior cerebellar artery aneurysms, surgical exploration showed possible parent artery occlusion by clipping. Therefore endovascular coiling was performed for both aneurysms directly afterward, with resulting neck remnants to prevent early rebleeding. One aneurysm showed recanalization 2.5 years afterward and was finally clipped then. In the present study, 57.4% of the aneurysms showed complete occlusion at initial treatment; a tendency to recanalize was found in 47.4% of the aneurysms at latest angiographic follow-up examination (mean, 1.7 years). In the literature, initial overall complete occlusion is reported in 32%–75% of treated posterior circulation aneurysms (6, 17, 18). Recanalization rates ranged from 14% to 33% (17–19). Our data are generally consistent with the findings in prior reports when differences in grading and terminology are considered. With regard to initial complete obliteration and recanalization rate according to aneurysm size, we could demonstrate a statistically significant difference between small and large aneurysms, but not between small and large neck size. This is in contrast to the findings of Vallée et al (6), who indicated in their 6-year follow-up of GDC-treated basilar tip aneurysms that the initial aneurysm neck size was the only independent predictor of initial occlusion rate and revascularization. We found that aneurysms 7 mm or greater in maximal diameter were more likely to be incompletely occluded or to show recanalization. This difference could be explained with the different technical approach: in this series, we did not use remodeling technique for wide-necked aneurysms but did use TriSpan and stents (Neurovascular, Metronik, Neuroform, Boston Scientific) during the final years. Long-term angiographic follow-up is important to disclose modifications of the occlusion rate of the aneurysm. In seven (15.6%) treated patients a retreatment due to recanalization was needed. One aneurysm was completely occluded at initial treatment, five showed a neck remnant and one was only incompletely obliterated. Therefore, suboptimal anatomic results involve a persistent concern for late recurrence. Four patients underwent recoiling, and three patients underwent surgical clipping. Surgical occlusion of recanalized aneurysms after incomplete endovascular treatment may remain a clinical option. Initial complete occlusion rate was higher in aneurysms >7 mm (50.0%) in group 2 compared with group 1 (30.8%), but there was a higher overall initial complete occlusion in group 1 (62.5%) compared with group 2 (54.5%). This may be because of the higher rate of small aneurysms in group 1 (11/24) than in group 2 (6/22). Larger aneurysms need to be packed with more coils to achieve complete occlusion. Our data suggest that 3D coils facilitate initial attenuated packing of larger aneurysms. Overall recanalization rates remained similar in both groups. On the basis of 11 years of experience, Murayama et al (9) found an overall recanalization rate of 20.9% in aneurysms of the anterior and posterior circulation treated by endovascular approach. There was an improvement from 26.1% recanalization rate in the early group to 17.2% recanalization in the later group. They noted that recanalization was related to the size of the aneurysm dome and to the aneurysm neck. We could not find a correlation between neck size and recanalization rate. In a recent study, Vallée et al (20) evaluated the immediate anatomic and clinical results of treating intracranial wide-necked aneurysms by using 3D GDCs. They found 3D GDCs to be useful for improving coil packing and angiographic and volumic occlusion of aneurysm with a neck size >4 mm, provided sac-to-neck ratio was >1.5. With the introduction of new coil technologies and adjuvant devices, the percentage of completely occluded aneurysms after endovascular treatment and during long-term follow-up may further increase. There was no case of procedure-related mortality (0%) in our series, compared with rates ranging from 0% to 3.8% in other posterior circulation series (7, 21–23). The permanent treatment-related morbidity rate of 4.3% compares with other series ranging from 0% to 4.8% (6, 18, 23, 24). Like in other series, thromboembolic events and aneurysm perforation seem to be the most common and worst complications (25). No subsequent bleeding was observed during follow-up of the patients completely or partially treated. The prevention of short-term and long-term rebleeding was excellent. This confirms the low incidence of rebleeding after GDC occlusion reported in other endovascular series ranging from 0% to 3.3% (18, 23, 26). We suggest from our data that the angiographic occlusion rate may not be the only significant factor in preventing rebleeding. The main reason to obtain partial occlusion only was the periprocedureal situation, that no further coils could be introduced into the aneurysmal sac without occluding the parent vessel. This resulted in an inadequate occlusion of the aneurysm neck or base, but with exclusion of the aneurysm dome from the circulation. Thus, our preliminary data may suggest that sufficient coiling of the dome of the aneurysm may be one of the important factors to prevent short-term and long-term rebleeding. Of all patients treated, 77.7% recovered initially to an independent status according to a GOS score of V–IV, which compares with published posterior circulation coiling series with 78%–91% of the patients achieving an independent clinical status within 2–13 months. At long-term clinical follow-up (mean, 39.6 months), 94.6% of the patients presented with a GOS score of V–IV. Birchall et al (7) reported 86% of independent clinical outcome in their mean 42.7-month clinical follow-up, as did Tateshima et al (8) in a series of 75 basilar apex aneurysms with a mean clinical follow-up of 31.3 months. Other data with a long-term mean clinical follow-up of 21.0–27.4 months showed an independent status in 70%–90% of the cases (17, 27, 28). These reports together with our data suggest a good long-term clinical outcome of treated patients. For patients who presented with SAH, the Hunt and Hess and WFNS grade at presentation were significantly predictive for the clinical outcome, whereas Fisher score was not. Both the natural history of intracranial aneurysms and the risk associated with the procedure must be balanced in the therapeutic decision. The International Study of Unruptured Intracranial Aneurysms (ISUIA) found higher frequency of intracranial aneurysms in general population and lower incidence of aneurysm rupture than expected (29, 30). This study reported a higher 5-year aneurysm size–dependent cumulative rupture rate for patients without a history of SAH with posterior circulation aneurysms as compared with anterior circulation aneurysms (30). Of the 10 patients with unruptured aneurysms who were treated at our institution 90% recovered initially to an independent status. One patient with an unruptured aneurysm and multiple extracranial diseases died during the hospitalization because of a metastasizing carcinoma of the mamma. In one patient, a perforation of the unruptured aneurysm with subsequent intraventricular and thalamic hemorrhage occurred and caused permanent morbidity. In our series, GDC technology was an effective and safe technique for the treatment of posterior circulation aneurysms. Aneurysm sac size was predictive for occlusion rate and the Hunt and Hess/WFNS grade for clinical outcome. The introduction of 3D GDCs into our practice significantly improved the initial occlusion rate but did not affect the incidence of recanalization. Accepted after revision December 24, 2004.